Scrap quilt made from a myriad of different materials, cottons, silk types velvets etc. Alternate rows have triangles and odd shaped pieces with in between rows of squares and rectangles in smaller pieces. It is completely machine pieced. There is no padding. The backing is blue slub rayon and is brought to the front to form a border. 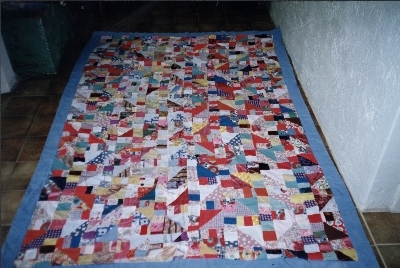 The quilt belonged to Daisy Brown of Murrumbeena Victoria, the grandmother of the present owner Val Wilkinson. Daisy died in 1974 aged 83. It is thought she bought the quilt at a church fete. The maker is unknown. The quilt is not used.